4 articles sur 5 ont été vendusL'offre est terminée. 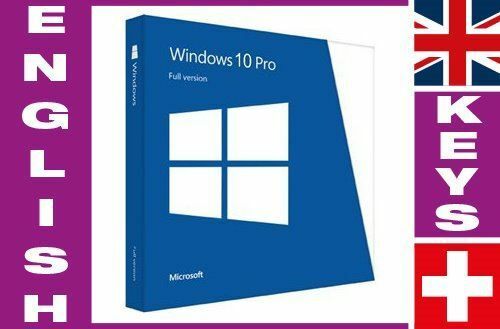 Windows 10 Professional full version license key. One-time payment and "Lifetime" license (no subscription, no annual fees), without expiration date. Multilingual and updatable. This offer is aimed at companies and can be used both commercially and privately. You pay only after successful activation! This product is declared as used, but in no use, for this reason released for sale. The product key is intended to be activated once on a computer. The useful life is unlimited, as long as the product is used on the same device. If the computer is reformatted, reset or changes are made to the hardware, there is no guarantee that the product key will continue to work on the computer. The Pro key is not intended to be upgraded from Home to Pro (is in the BIOS) and only works if Windows is completely rebuilt. If you want to upgrade from Home to Pro, there are "tricks" for how to do that without having to do a complete reinstallation. We will gladly send you these on request (without guarantee). Delivery takes place within 24 hours, but usually immediately after receipt of order. After installation / activation you can pay. If a key does not work, we will replace it immediately for free! (Activation with other / modified Internet / retail versions may fail, is extremely rare, and if it does, you will immediately get back a new key or money). You have no risk. The delivery is completed with the transmission of the product key by e-mail after the purchase, there is no shipping by post. Please check the spam folder directly on the mail server of your provider (especially for bluewin). Often the emails with the keys end up there, not in your inbox. If you prefer a USB stick with the installation file, we will send it to you for an additional charge of 9.90 Fr. by A-Courier. Let us know after you have bought. With the USB stick, you just have to double-click on the Setup.exe file and the installation starts automatically. Then simply enter the license key when prompted and the installation is carried out fully automatically from the USB stick. With us, you will receive particularly attractive second-hand licenses from volume licensing agreements that are legally treated in the same way as parts of volume licenses when you first acquire them. The splitting of volume licenses for the purpose of separate resale is legal. This follows, inter alia, from the judgment of the European Court of Justice in Case C-128/11. This ruling deals with the exhaustion of rights to software and was confirmed by judgment of the Federal Court of Justice of 17.7.2013 in case I ZR 129/08 for the national legal understanding of used software. Finally, the Higher Regional Court Frankfurt on 18.1.2.2014 has also confirmed these principles for Splits from Volume Licensing Agreements. (AZ 11 U 68/11). Switzerland has adopted this practice. All brand names and brand logos are registered trademarks, the use of which is used here only for product description - the ownership is the respective brand owner.